Purpura is a hemorrhagic condition that occurs when not enough normal platelets are available to plug damaged vessels or prevent leakage from even minor injury to normal capillaries. Purpura is characterized by movement of blood into the surrounding tissue (extravasation), under the skin, and through mucous membranes, producing spontaneous ecchymoses (bruises) and petechiae (small, red patches) on the skin. Purpura measure between 4 and 10 mm (millimeters) in diameter. 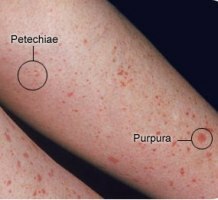 When purpura spots are less than 4 mm in diameter, they are called petechiae. Purpura spots larger than 1 cm (centimeter) are called ecchymoses. There are many different types of purpura. Their classification depends on the appearance or cause of the condition. Idiopathic thrombocytopenic purpura (ITP), also known as primary immune thrombocytopenic purpura and autoimmune thrombocytopenic purpura, is defined as isolated thrombocytopenia with normal bone marrow and in the absence of other causes of thrombocytopenia. ITP has two distinct clinical syndromes, with typical manifestation of an acute condition in children (spontaneous resolution within 2 months) and a chronic condition in adults (lasting longer than 6 months). 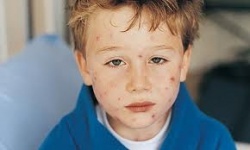 An average estimate of the incidence in children is 50 cases per 1,000,000 per year. Peak prevalence occurs in adults aged 20-50 years. Peak prevalence occurs in children aged 2-4 years. Approximately 40% of all patients are younger than 10 years. Recent viral infection. Many children with ITP develop the disorder after a viral illness, such as mumps, measles, influenza or a respiratory infection. The primary focus of a pharmaceutical approach to the treatment of ITP is to raise the individual’s platelet count. They may also be asked to stop taking medications that impair platelet function, such as aspirin, blood thinners, and ibuprofen . The doctor may start with a corticosteroid medication, which can help increase the platelet count by decreasing the activity of the immune system. It usually takes about two to six weeks for their platelet count to return to a safe level. When it does, the doctor will discontinue the drug. If your purpura is causing severe bleeding, your doctor may give you an intravenous medication called intravenous immunoglobulin (IVIG). They may also give you IVIG if you need to increase your platelet count rapidly before surgery. This treatment is usually effective in increasing your platelet count, but the effect is usually only in the short term. It can cause side effects such as headache, nausea, and fever . Thrombocytopenia can be caused by decreased production or increased destruction of platelets. Historically, ITP was believed to be caused by increased platelet destruction at a rate that exceeded production by a compensating bone marrow. However, new knowledge has questioned this model, providing evidence that platelet production is also decreased in many patients with ITP. In people with ITP, an unknown cause leads antibodies produced by the immune system to attach themselves to the platelets, marking the platelets for destruction. The spleen, which helps the body fight infection, recognizes the antibodies and removes the platelets from your system. The result of this case of mistaken identity is a lower number of circulating platelets than is normal. A normal platelet count is generally between 150,000 and 450,000 platelets per microliter of circulating blood. People with ITP often have platelet counts below 20,000. Because platelets help the blood clot, as their number decreases, your risk of bleeding increases. The greatest risk is when your platelet count falls very low — below 10,000 platelets per microliter. At this point, internal bleeding may occur even without any injury. Older patients have more severe and rare bleeding manifestations, such as GI bleeding and possibly intracranial hemorrhage secondary to co-morbidities such as hypertension. ITP directly affects the dermatologic and hematologic systems. It does not directly have any other systemic involvement. However, the section above titled "Associated Co-morbidities" includes some of the co-morbidities associated with ITP that may have systemic involvement including the gastrointestinal or endocrine systems. Treatments include medications and sometimes a splenectomy to remove the spleen. See above section titled "Medications". If medications aren’t effective in treating your purpura, your doctor may recommend a splenectomy. Removing the spleen is a fast way of increasing your platelet count. This is because the spleen is the main body part responsible for eliminating platelets. Physical therapists are not able to treat or diagnose idiopathic thrombocytopenic purpura, but are able to recognize differences in skin pigmentation and can refer the patient to a suitable specialist. If you are cleared through a physician to treat associated impairments such as general weakness, it is recommended that low-impact activities be performed over high-impact activities. Patients can have increased risk of injury, bruising, and bleeding. ↑ Goodman CC, Fuller KS. Pathology: Implications for the Physical Therapist. 4th ed. St. Louis: Elsevier Saunders; 2015.